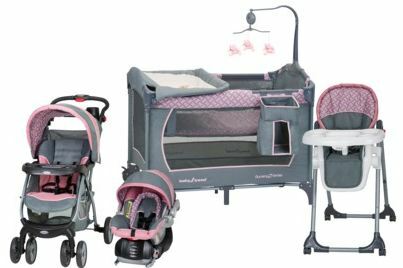 Save Up to 42% On The Baby Trend Giselle Collection, Ships FREE! Right now you can purchase the ENTIRE Baby Trend Giselle Collection at Target for up to 42% off! FINAL COST: $217.47. That's $132 (or 38%) off the list price of $350! If you have a Target Red Card this deal gets even better because you'll save another 5%! You'll pay only $202.85 after your 5% discount and the $75 gift card! All three items will ship for FREE! This is a fantastic deal, and lots of travel systems alone are more than the price of this entire collection! Plus, I'm loving the colors and print on this. If you are expecting a little girl or know someone who is then this is a GREAT deal for them! Hurry though because this deal ends Saturday (2/2 at Midnight EST).